Did you miss us Tuesday? It was a day of loafing, sloth, indolence. Movies of Heidi when she was a baby. Two crossword puzzles in less than 30 minutes. A 4 player video game. One of the Harry Potter movies. A day to sleep in and relax. Batteries recharged! So, nothing interesting to report. Just kids enjoying one another! OMSI! Then Voodoo donuts and IKEA for dinner. Do you like our shirts. Camper designed. This is short because my computer blew up. I hope to get it back soon. Thursday! The morning was spent with the children playing a 4 player game. It was wonderful to hear them enjoying themselves together. Just what we want from Camp Gramp. In the afternoon we went to the https://www.museumofglass.org/. It is fascinating to watch the people working in the Hot Shop. What skill. It is certainly hot work, but that was OK. The temperature is about perfect, and the smoke is beginning to move out. Tonight we could see the moon. Then we went briefly to the TAM – Tacoma Art Museum. Our crowd was less fascinated — hungry, I think. To remedy that, we went to Red Robin. Right now, instead of going to bed, three of the crew is in the back room watching Harry Potter. We have decided to have a close to home day tomorrow. We were going to go to the ocean, but we all have been enjoying just hanging around the house. We will probably to to Frey Farm to visit our friends the llamas. Other than that, it is at home! I didn’t do a great job at the picture taking today. It was a day to enjoy the sound of companionship! Our backpacking trip was marvelous. Sensational. Superb. I have just over a thousand pictures to prove it, which I’ll be spending the next several hours getting through. However, to tide you over until I get that magnum opus up, I have my mother’s Camp Gramp notes for days 3 – 7 for your enjoyment! To Marie in Downer’s GroveThanks!! I have Grey’s summer camp write-up in the works, and I’ll try to get that done in the next week! I have sad news to report. The much beloved bouncy house is too small to support all the children. In fact, they have to go in one at a time to get any sort of decent bounce. This is a catastrophe! The slit in the slide required re-taping, but even that didn’t provide enough bounce for the whole gang. It is tough getting old! The joys of childhood fade away, one at a time. We have a huge collection of toys in the attic which are no longer appropriate for the grandchildren we have. We ended the day with the traditional ice cream and an episode of Rocky and Bullwinkle. The Wasamatta U football story. That cartoon is rich in pun and innuendo. Day 4 — I lied. The camera remained firmly in its case and you will have to use your imagination. Today was Pacific Science Center day. The spy exhibit was a real hit! They learned about the Enigma Machine and saw a chunk of the proposed Moscow Embassy with 8 different kinds of listening devices embedded in the wall. Then we went to the Lego store, where Thane and Grey purchased Legos, Brain Marbles — or some such name, where Sebastian purchased a game called “Snake Oil”, and I fell victim to the pneumatic arm kit — yes really. It is so cool! Finally, we went to Target for Little Ponies stuff — I am sorry, Heidi! Giving kids choices sometimes has consequences. Grey saw the sign on South Hill Collision which says “Wreck Amended” and he thought it was hilarious! The sleeping room hasn’t quieted down so quickly tonight. They are still talking, but hey, it is Camp Gramp. 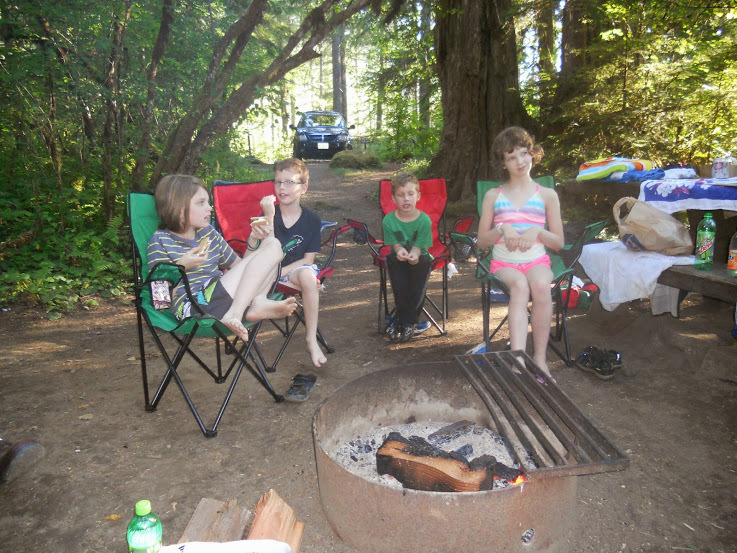 Tomorrow, day camping at Big Tree campgrounds. It has a lovely little stream for the playing and they are all ready to enjoy that. Editor’s Note – I don’t see a day 4, so we’ll just have to paint it in with our imaginations. The morning began with Lego assembly, before the adults were out of bed. My muffled voice emerged from the blankets, “Take the table cloth off the table and work there.” So Thane obediently took the table cloth off the table, put it on the floor and emptied the bags of pieces on the table cloth, on the floor. We played Sebastian’s new game Snake Oil, with fun results. It is like selling refrigerators in the arctic, but we enjoyed it. Thane’s reading is excellent for headed into K. There were, however, some little mistakes. Gmm washed clothes, imagine that. About 3, we went “camping” Camp Gramp style. That means we go to a favorite camp site, play in the stream, hike around, roast hot dogs and marshmallows, then go home to sleep. The weather is PERFECT. About 75, sunny, lovely! There was a nice breeze blowing through the trees. Just perfect! Then we broke “camp” and headed up to Paradise in hopes of finding the Cascade fox that hangings out in the parking lot in the evening. That was a wash. We saw only a couple of deer. No bear, no marmot, no Cascade fox. But it was really beautiful. The wildflowers, oh my! They are spectacular! I hope Brenda and Adam are enjoying them and the great backpacking weather. Day 7 — It is a joy to realize that children have learned from things you have done with them. But why did they have to learn that? Yesterday I took the 3 older ones on the tour of the submarine at OMSI. We got the shower lecture. He called it a sailor shower. 10 seconds of water, lather up and shampoo, then 20 seconds of water to rinse off. So, we needed showers, oh did we need showers. I sent Sebastian first. He came back in about 2 minutes — “I took a sailor shower!” Somehow I think the lather and shampoo section was not all it should have been. All of them took sailor showers, except Thane, who needs a shower, but definitely doesn’t want to take one. Today we went to Mowich Lake to pick up Brenda and Adam. That is such a beautiful place — flowers, crystal clear water, mountains, trees. It was amazing. The road was reminiscent of Zaire — pothole city for much of the way. But that was fun too.